Isidore Jules Bonheur (1827 - 1901) was born on May 15th 1827 in Bordeaux, France, and died in Paris in 1901. 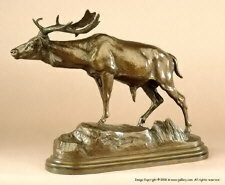 He was an important Animalier Sculptor, the brother of Rosa Bonheur and brother-in-law to Hippolyte Peyrol the founder. The Bonheurs were a well known family of painters, sculptors, and artists. Isidore studied painting under the tutelage of his father at a very early age. He moved on to sculpture in 1848 with his first Salon entry of a plaster study of An African Horseman attacked by a Lion. Isidore Bonheur continued exhibiting his sculpture throughout the years, both at the Salon in Paris as well as The Royal Academy in London. He won Medals at the Salon in 1865 and 1869, and won the Gold Medal at the Paris Exposition Universelle of 1889. Bonheur was awarded the Legion of Honneur in 1895. 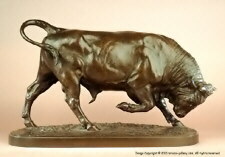 Isidore Bonheur's bronzes range from domestic cattle and sheep, which he excelled at, to wild bears and lions as well as equestrian and hunting groups, all done in a very natural and realistic manner. 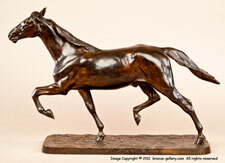 His Le Grand Jockey is one of his finest models and is one of the icons of Animalier sculpture. 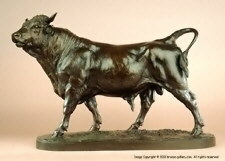 Many of his bronzes were done as compliments to his sisters' works. These sheep and cattle models by brother and sister were done as pairs. 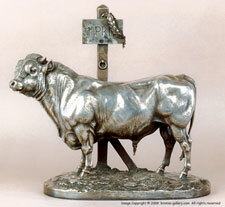 Almost all of his and his sisters' casts were produced by Hippolyte Peyrol whose extremely small (less than 1/16") foundry mark is often very difficult to locate. Though somewhat overshadowed by his flamboyant and outspoken elder sister Rosa, Isidore Bonheur was nevertheless was a highly accomplished sculptor and his works rank among the finest of the French Animalier school. 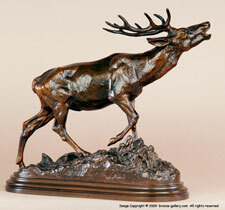 The Perigueux Museum exhibits a life-size version of his eight point Stag. Among the monuments that he cast were, his sister's memorial statue at Fontainbleau completed in the last two years of his life, and two stone lions for the Palais de Justice. Isidore Bonheur's Royal commissions extended beyond France where he was commissioned to produce two monumental Bulls for the Palace of the Sultan in Constantinople as well as works for King Edward VII of England. 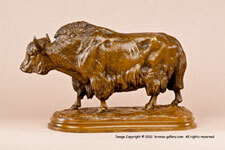 His bronze sculptures are always signed I. Bonheur and the earliest Peyrol casts from the late 1840's are unmarked.